After getting vanquished in a beer pong match, a group of sore losers opened fire early yesterday at a Texas house party, wounding a female reveler, police report. The 1:20 AM shooting Sunday took place at a residence in Ames, a city 45 miles from Houston. According to the Liberty County Sherriff's Office, investigators are searching for two men who allegedly shot up the party after losing at the beer pong table. Deputies identified the suspects as Decoris “Red” Rucker, 24, and Chris “Crazy Chris” Hackett. 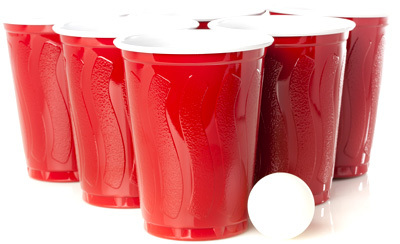 Rucker and Hackett were among a group of five men who became upset after losing a backyard beer pong game. The men, witnesses said, ran from the home while firing wildly at partygoers. An 18-year-old woman was shot in the thigh during the gunfire. Rucker, Hackett, and the other men fled in a 2006 Buick. Seen at left, Rucker, a convicted felon, has a lengthy rap sheet that includes burglary, assault, weapons, and drug arrests. In April, he was busted on several felony narcotics counts. While no arrests have been made in the beer pong shooting, cops expect to file aggravated assault with a deadly weapon charges against the gunmen. Air Force Member Arrested After Giving Minnesota Cop A "Wet Willy"